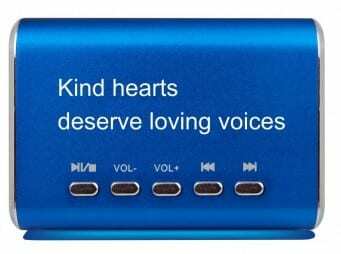 A LifeOnRecord Keepsake Speaker plays all your recordings without needing a CD player. This is a compact, (2 inch, by 2 inch, by 3 inch), stylish aluminum speaker that packs a surprisingly loud sound for such a small package. It has a long-lasting rechargeable battery that lasts through about 10 hours of constant playing. 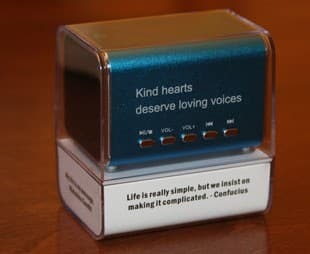 The speaker has controls to skip forward and back through the recordings, to pause the recordings, and to control the volume. 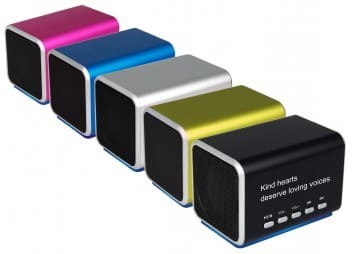 The speaker comes in five different colors. 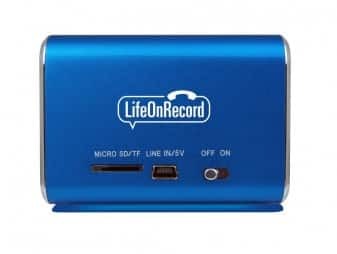 The speaker, memory card with recorded voices, and charging cable is $35, and you will receive a 10% discount on the keepsake speaker when ordering the LifeOnRecord Ultimate plan. Shipping is free.